HEIDI FISKE | Is Trump Seeking War? 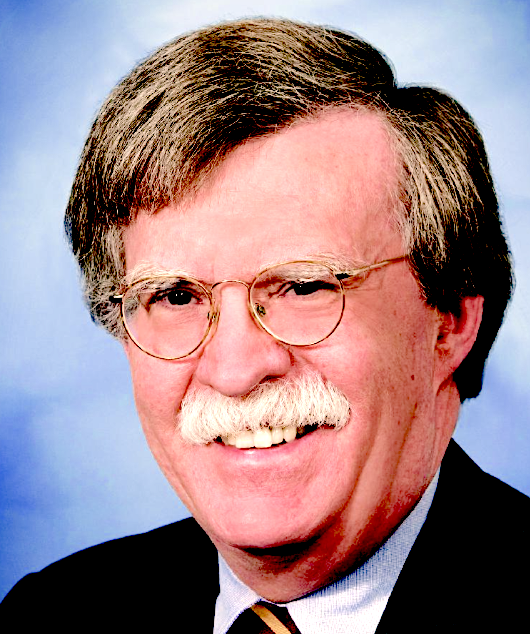 Pundits right and left fear that John Bolton as National Security Advisor could cause us to stumble into war. But what if it isn’t stumbling? What if Trump is actively seeking to take us into war? There are three reasons why this is possible, if not likely. I number them below. But let’s begin with the background. Before the Bolton appointment, Trump had been priming the war pump in several ways. First, 60 percent of the top diplomats in the State Department left under Secretary Rex Tillerson, reducing our ability to negotiate, or gain support from allies. To this day there is no ambassador to South Korea. The top U.S. official there, since January 2017, is chargé d’affaires Mark Knapper. Next, Trump fired Tillerson, who urged keeping the Iran nuclear deal in place and who advocated talking with North Korea, to be replaced by Mike Pompeo. As head of the CIA, Pompeo was the only Trump cabinet member to argue for decertifying the Iran nuclear deal. Not only could that in itself lead to war, but it should make North Korea discount any promise Trump might make in talks with Kim. Finally, the cherry on the top, is Bolton. He has argued for a pre-emptive strike against North Korea (“The legal case for striking North Korea first,” The Wall Street Journal, February 28, 2018); bombing Iran (“To stop Iran’s bomb, bomb Iran,” The New York Times, March 26, 2015), and to this day he supports our having started the Iraq War, which many others regard as the greatest strategic mistake in our recent history. Bolton will start his new job just as the final jockeying about conditions for the Trump/Kim talks are being worked out – talks whose only purpose, he has said, is to prove that talks don’t work, thus clearing the way for military action. He will also start just about the same time as the Iran nuclear deal needs to be recertified on May 12. Trump’s tactic throughout his campaign and Presidency has been to drive unpleasant news off the front pages by creating a new ruckus. When he was taking heat over his stance on the healthcare bill and response to the hurricanes, for instance, he started the stink over football players kneeling during the national anthem. Now multiple amatory scandals, and the Mueller investigation, dominate the news. Very few things could top these in importance or reader appeal. War, however, could drive both off the front pages. Trump has good reason to think he’s Teflon. The tax legislation, tariffs, and removal of financial protections could all hurt him with his base – but they haven’t much yet. While an exhaustive January poll by Morning Consult found his approval down among all voting blocs, his support is still well over 40 percent among whites, military personnel and households, private sector workers, all Christians, southerners, retirees, those earning over $50,000, men, all adults, and well over 70 percent among Republicans as a whole, and Republican men and women separately. And his approval is still 87 percent among those who voted for him in 2016. Trump surely remembers the record of another ever-less-popular President, George W. Bush. In May 2004, during the runup to his re-election, a CBS News poll found that Bush’s negative rating was 65 percent, and that, from January 2004, “majorities of the public have consistently said the U.S. is off on the wrong track.” Yet he was re-elected: Why? Here is a stunning statistic: No wartime President has ever failed to win re-election. So let’s suppose for a moment that Trump wants to go to war. What’s to stop him? Congress, you might think. Not so fast: The 1973 War Powers Resolution gives the President 60 days to deploy troops before war must be declared by Congress. And obviously after those 60 days we could be in such a morass that there would be no turning back. Bolton doesn't need Senate approval, but he might not get a security clearance before he is scheduled to start work in April. Pompeo might not be confirmed by the Senate – highly unlikely, while the President retains high ratings with his base. And who knows whom Trump would nominate next? Thus this observer concludes that there is at least a 50-50 chance that we are on our way to a new war, or wars. The President’s personnel choices are not the cause. They are more likely the result of his desire for war. education and personal finance. 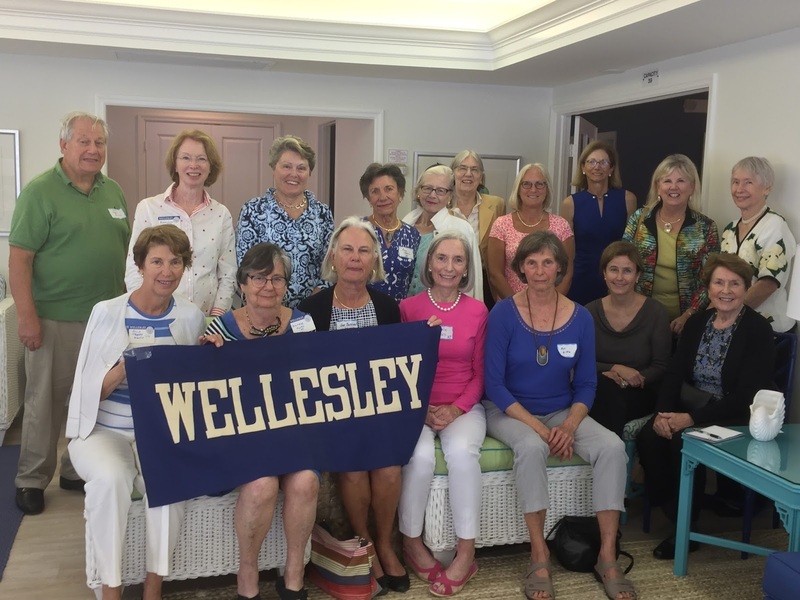 Alice Tepper Marlin '66 is holding the "W"
March 23, 2018 – Professor Ann Witte spoke earlier this month about early childhood education to a group of Wellesley Alumnae at Bay Colony, a community near Indian River Shores Town Hall on A1A in Vero Beach, Florida. Her research has focused not only on early childhood care and education but also on how to empower people to manage their finances and how memory affects and changes as time passes. At Wellesley College, she was a tenured professor of economics who taught personal finance (ECON 223) in the 2006-2010 period, an interesting one! The Wellesley Economics Department web page includes the obituaries of two economic professors whom I knew quite well, Soviet-Russian expert Marshall Goldman and housing-value econometrician Chip Case. Professor Goldman was on the Executive Committee of Economists for Peace and Security with me, when I was serving as Treasurer. She also worked on ways to improve financial education including development of a MOOC and flipped classrooms. She served as a consultant to research projects to help people manage their finances and co-authored two books in that arena with fellow Wellesley College instructor Saundra Gulley. She uses statistics and microeconomics to analyze and affect public policies and was a principal investigator of the 2012 National Survey of Early Education and Care in the United States. Other Wellesley College-related posts: 2014: Wellesley '66 Visits the LongHouse Reserve, East Hampton . U.S. Capitol. Photo by JT Marlin. The following Update 258 from Dana Chasin in Washington, D.C. reports on the Omnibus bill to fund the U.S. government through September. It is posted here by permission. Update, March 23, 2:30 a.m.: A $1.3 trillion spending bill was passed an hour ago, funding the Federal Government through September 2018. Passed already by the House on Thursday, the bill now goes to President Trump to sign. Congressional leaders and White House officials reached a deal on H.R. 1625, a 2,232- page, $1.2 trillion [finally $1.3 trillion] fiscal 2018 omnibus spending package. President Trump’s FY19 budget request proposed cutting $54 billion from the existing non-defense statutory cap. House Republican Appropriations bills were written at a level cutting $5 billion from the total cap. Following the Republican majorities’ failure to enact Appropriations laws, the Bipartisan Budget Act of 2018 increased non-defense discretionary (NDD) spending by $63 billion. The omnibus conforms with the Bipartisan Budget Act of 2018 mandate. Majority Leader McConnell, Minority Leader Schumer, Speaker Ryan, and Minority Leader Pelosi may adjust these spending numbers and strike the final deal to avert a government shutdown before midnight tomorrow. The bill would extend the government’s spending cliff to September 30, guaranteeing six months without a major budgetary shutdown. 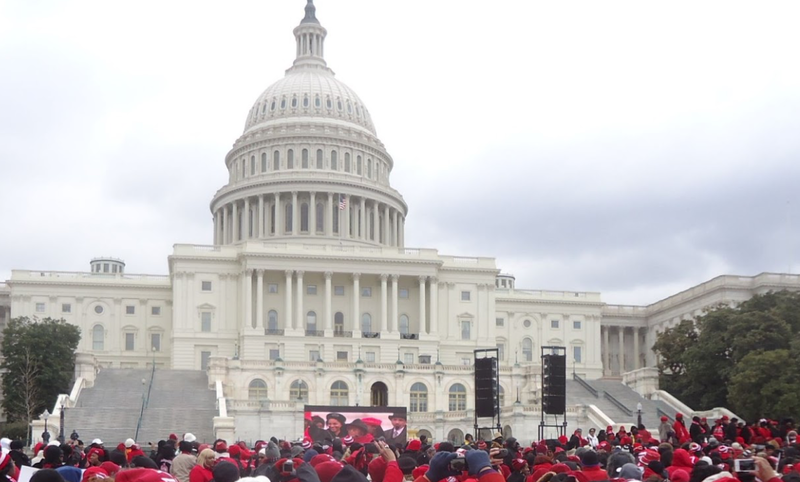 The debate around the omnibus focused on a few key provisions each with their own nuances regarding funding levels, disbursement schedules, and administrative issues. Democrats faired fairly well in these negotiations. 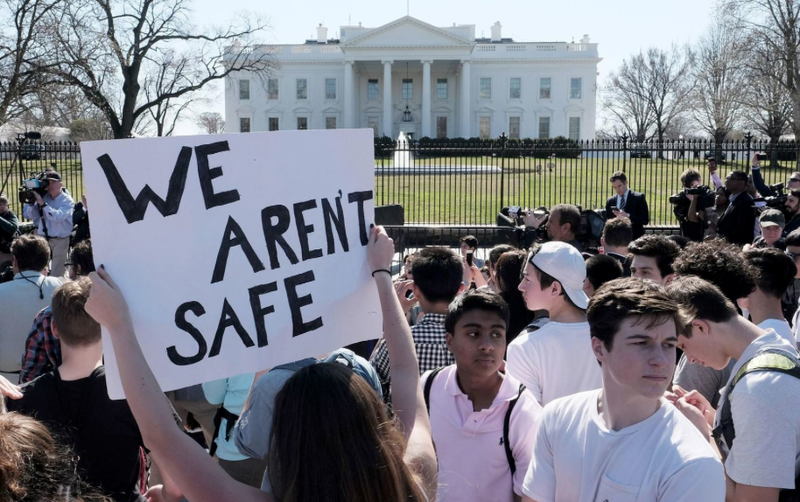 One victory was an item to permit the CDC to study gun violence by incentivizing municipalities to update the NICS database, which is used for background checks. Democrats also beat back attempts by Sens. Collins and Alexander to fund high risk pools in the health insurance marketplace. Similar provisions: limiting the funding for Trump’s wall to narrow projects, primarily reinforcing and updating existing fencing. But Democrats are not fully onboard with this bill. Freedom Caucus Republicans and Rand Paul are not enthused about this bill as it increases spending by $143 billion; they have said that Speaker Ryan and Majority Leader McConnell left too much on the table. 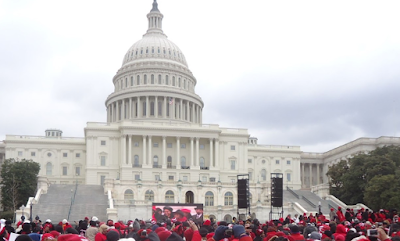 Packed into this very large omnibus package are numerous policy riders on issues that run the gambit from health care to labor issues, to environment and more. With respect to economic policy, the following policy riders related to tax, infrastructure, and financial regulation were worked in. • Tax Riders: Apparently, the “meticulous” legislative process surrounding the Tax Cuts and Jobs Act missed a few details. • IRS Funding - Despite Trump’s expressed desire to cut IRS funding, this deal increases its budget. The omnibus also allocates $320 million to the Internal Revenue Service to support the agency as it implements the new law. Though the IRS will still be prohibited from auto-completing parts of tax returns, a continued victory for tax preparers like Turbotax. In addition, the base IRS budget was cut by $125 million from 2017 in nominal terms, making the net gain of $195 million. • The Tax “Grain Glitch” Fix - Representatives from farming states have decried a glitch in the Tax Cuts and Jobs Act that gives farmers greater tax savings if they have sold crops to farm cooperatives at a disadvantage to corporate competitors. Agricultural trade groups pushed Senators like Chuck Grassley (R-IA) and Pat Roberts (R-KS) to change this “Grain Glitch”. The proposal, that limits farmers to a 20 percent deduction of their net income from sales to cooperatives, has been included in the omnibus. • Low-Income Housing Tax Credit - In exchange for the “grain glitch” amendment to the GOP tax law, Democrats were able to win an expansion of the low-income housing tax credit by 12.5 percent from 2018 to 2021. • Infrastructure Spending: The omnibus also includes minimal increases in infrastructure spending. While the funds are badly needed, significantly more funding is needed to address the nation’s crumbling infrastructure. The American Society of Civil Engineers estimates, conservatively, that Congress will require a $2 trillion investment over the next decade to adequately address the nation’s infrastructure needs. • Dodd-Frank Rider: Just after the Senate passed its bipartisan banking bill, S. 2155, House Republicans continue to take aim at the Dodd-Frank Act in the omnibus bill. But the financial services rider the GOP won here is of marginal significance, merely requiring the OMB to report on Dodd-Frank’s cost. • Cost Estimates of Dodd-Frank Implementation - The omnibus includes a provision requiring the OMB to report to the Appropriations Committee on the cost of implementing the Dodd-Frank Act. March 20, 2018 – Charlie Miner, Jr. interrupted his studies at Princeton (Class of 1943) to volunteer as a bomber pilot. He died yesterday, according to his daughter, and Vero Beach resident, Charmaine Caldwell. A memorial service in Vero Beach is planned for May 3 and possibly another subsequent one in East Hampton. The following is a slightly edited (with a sad new ending) version of an article I wrote about Miner for The Vero Portfolio, May-June 2015 issue, p. 24. 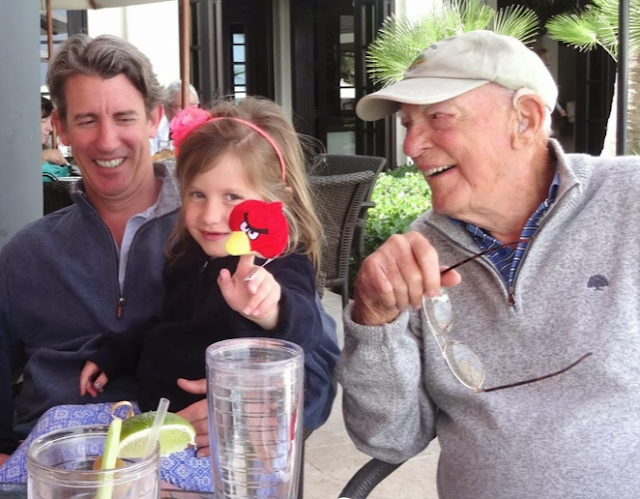 Charlie Miner was one of seven grandchildren of his illustrious grandfather, FDR’s first Treasury Secretary, Will Woodin. His mother was Woodin's eldest daughter, Mary, who married an infantry captain, Robert Charles (Charlie) Miner, Sr.
Charlie Miner, Jr. divided his time at the end of his life between Vero Beach and East Hampton. When his beloved cousin Anne Gerli died in 2016, he gave up spending time in East Hampton. He was lucky to have survived. Of 16 million American veterans of World War II, fewer than one in 16 survived as of 2015, only 80,000 in Florida. That year Miner was one of only about 250 World War II vets left in Indian River County, and may be Indian River County's oldest surviving European-theater WWII bomber pilot. 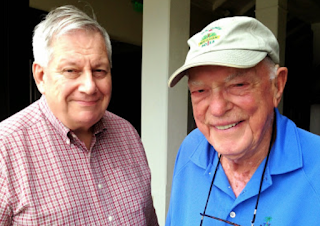 Miner told me how much he loves Vero Beach, Fla. Years ago in the 1950s and 1960s, he spent time with his mother (who divorced Charlie Sr. and did not remarry) in the Riomar social life. It revolved, he said, around rotating dinners and celebrations among the original 12 houses. The 30 residents took turns throwing parties. The Riomar Inn came later. John's Island—where Miner and his late wife Maisie lived now—opened in 1970 and was at first resented because it drew people away from Riomar (and then it became successful and was imitated by the Moorings). Charlie Miner’s grandfather, Will Woodin, was the man who dealt with the Wall Street and banking panic that started in 1929 and was not put to rest until FDR came into office in March 1933. FDR's first Treasury Secretary was given wide latitude in addressing the problem. Will Woodin was born in Pennsylvania and settled in New York after a successful career as the CEO of a huge business, American Car & Foundry (ACF) selling railroad rolling stock. It was called the "Car Trust" because back then a "car" was a railway car. From 1916 to 1928 he headed up a company whose stock was one of the 20 in the Dow Jones Industrial Average. A cousin of his headed up the locomotive company (ALCo) that was another of the 20. Woodin had four children. The eldest and youngest settled in Vero Beach — Mary Woodin Miner and Libby Woodin Rowe. Libby’s husband, Wally Rowe, and a brother bought homes in Riomar. Mary and Libby eventually lived in Vero Beach most of the year. Charlie’s mother lived in John's Island after Riomar and died in 2007 at 102. Charlie remembers not just the bridge that connected the two sides of the Indian River, "Beachland Boulevard" where Route 60 crosses, before the concrete-arch Barber Bridge. He remembers the drawbridge that was built earlier, in 1995. Before that, back in the 1930s, there was a bridge made of wooden railroad ties and swung around horizontally to let boats through the Indian River. Back in those early days Beachland Boulevard was the northern edge of Vero Beach, and there wasn’t a Riverside Theater. Charlie says the money was raised in several ways. Rosie and Sterling Adams organized a dance every year. He and his cousin, Bill Rowe, used to sell season tickets and organized an auction of donated prizes to raise money for the theater. The Theater is, of course, now a major institution in Vero. For a long life: Every morning a meal of two eggs and tomato juice or V-8 (with or without the hair of the dog). During the many recent years that I have been studying and writing about FDR's forgotten first Treasury Secretary, Charlie's grandfather, I and my wife Alice have been amused and impressed by Charlie's joie-de-vivre and his sharp recollections of his long life. Learning of his death at 96 years old was a sad moment. 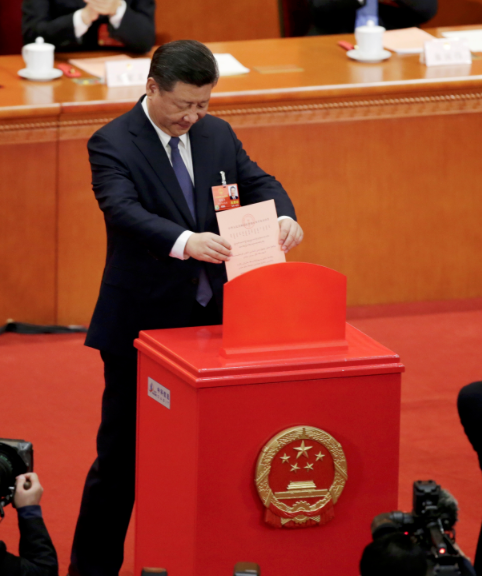 Over the weekend, the final step in Xi Jinping’s grab for life-long power in China was completed when the National People’s Congress voted 2,959 to 2 (there were three abstentions) to abolish term limits for his job as president. Xi also heads the military and the Communist Party. 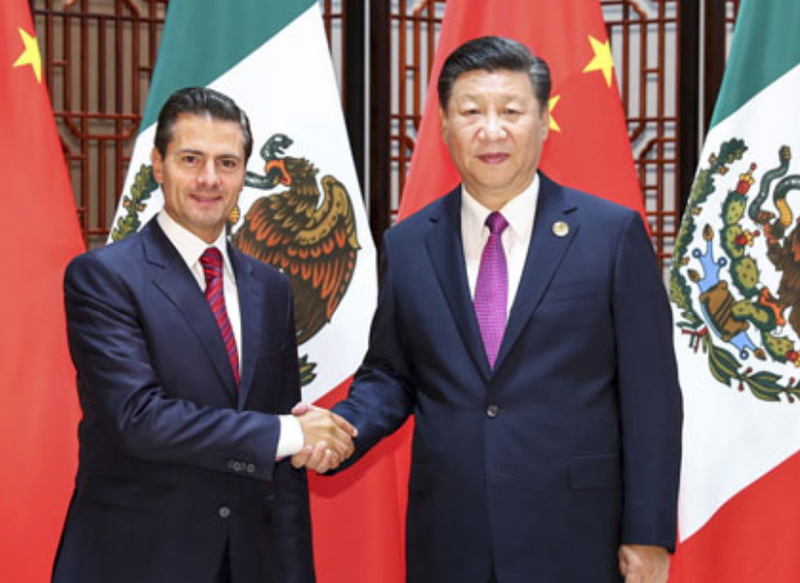 As China ramps up its presence in Latin America, this authoritarian spirit could become a problem for Mexico, especially if it opts to depend on Chinese infrastructure projects. Does this sound unlikely? Well, consider this: http://bit.ly/2Dm48Cf. Our president is behaving like the monarch in The Little Prince. He orders people to do something. Then, if there is any problem from His Base, he changes his mind and orders people to do the opposite. "It is contrary to etiquette to yawn in the presence of a king," the monarch said to the little prince. "I forbid you to do so." Luckily, this is not a monarchy. One year ago the American Banker displayed the chart at left, suggesting that tech jobs were in competition with many Wall Street jobs. Greg David recently in his Crain's blog expressed appreciation for the growth of tech jobs in New York City, as a diversification of highly paid employment within NYC. The following unedited (except for formatting) dialogue on this topic between Edward Greenberg, an attorney in New York City, and me were posted as comments on the Crain's blog and are re-posted here by permission of Mr. Greenberg. 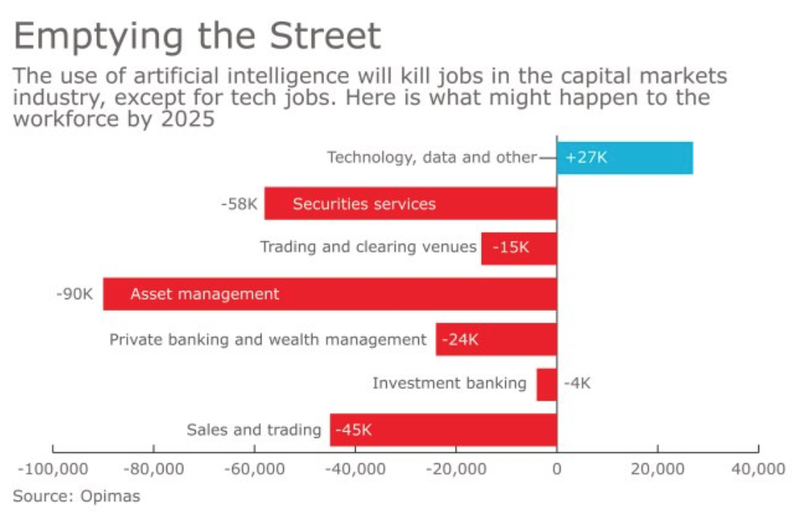 An underlying question is whether tech jobs are substitutes for Wall Street jobs, as indicated in the chart above, or are complementary. Hollow out its employment base? Permit financial jobs to migrate to other cities? Very nice news but for context – there are 80,000 (2/3 of NYC's) such "defined" jobs in Los Angeles, a city with less than 1/2 the population of NYC. The population of the LA metro area is 13.5 million and NYC's is 20.3 million. LA is not considered a "tech hub" like Northern Ca or even Boston. So while the number of tech jobs in NYC sounds like, and is in fact, good news, it is being employed by our politicos for their own PR purposes. By NOT comparing these figures to other major cities the figures become distorted and not indicative of anything that our politicos can take credit for. Forbes does not list NYC in its top 10 cities for tech job growth. It does list cities like San Diego, Raleigh, Nashville (metro area) and Jacksonville, FL (where there has been a 72.4% increase in tech jobs from 2001 to 2017. Every new job in NYC is good news but other cities are doing better in attracting these type businesses and jobs. If NYC "rests on its fake laurels" it will continue to fall behind other cities in attracting these jobs. The author is spot on regarding the amorphous "definitions" employed to define tech sector and "eco-system" jobs. A coffee shop across the street from Google HQ which serves Google employees is clearly part of the tech "eco-system". Response to Edward C. Greenberg, March 1, 2018. I agree that understanding the significance of the tech sector in New York City requires comparing New York with other cities. The New York City Comptroller's Office did this in 1999, just before the way the job numbers are aggregated was changed. An MIT Professor solemnly told me 20 years ago that New York City could never catch up with Boston as a source of startups servicing financial institutions. MIT was developing “aggregators” that would, he said, soon be collecting financial information from individuals and assembling them in one place, across platforms. That process is taking longer than he predicted. Meanwhile, New York City financial technology jobs have been growing because Wall Street wants these vendors close by. Those high-frequency traders have to be nanoseconds from their platforms. Wall Street and NYC tech workers stand or fall together. NYC's preeminence in the financial world of the next decade depends on both. The 1999 NYC Comptroller's report on the growth of tech jobs noted the difference between counting tech occupations and tech-oriented companies. The data-counting problems are too great to opt for one or the other. The problem is with the aggregation process. We depend on the BLS for data, and the BLS makes it hard to count payroll local jobs by claiming that disclosing information would allow researchers to get down to the company level and discover proprietary information. It is sad for that reason that BLS moved many research functions out of New York City to Boston (and Philadelphia). NYC's 1911 Triangle Fire gave rise to the Labor Department and New York City was one of the earliest research centers on job data. Senator Ted Kennedy was reportedly active in promoting the move of BLS staff positions moved from New York to Boston. A good understanding of how financial and technology jobs interface is important to New York City. It is also important to the country. We need more and better research on what is happening to jobs in the intersection between finance and technology. Agreed – with one key addition. Lots of traditional Wall St, banking and financial service jobs moved from NYC to NJ, FL, S. Dakota and Utah. The concept of "geographic proximity" is rapidly becoming an anachronism. The notion that an NYC company would have "back office personnel" 500-1,500 miles from Gotham was unthinkable 25 years ago. Today it is the norm. The Internet did not come into meaningful public use until the 1980's; computer driven trading came in about the same time. Pick up a WSJ, NYT, Forbes, Fortune or The Economist from the era. Try to find one that remotely predicts the manners of business and locations of major insurers, banks and stock trading which would exist in 2018. Geography as a factor will soon be entirely irrelevant. Gothamites still don't believe the number of companies and jobs in these sectors moving to or already located in FL, TX and various other flyover states most of which New Yorkers have never set foot in. Did your buddy use the term "near shoring" in 1999? Betcha a beer he didn't. Yes, geography is less relevant than it used to be. But no, geography will never be irrelevant, even to technology. The way in which it is relevant is changing. One of the strengths of the United States is that we have many strong population centers that are highly interconnected. New York City's greatest strength has been its ability to lead the country in finance and communications. This in turn pulled in many corporate HQs. Financial institutions have always used every means of communication they could. Before the telegraph, they used carrier pigeons as well as horseback couriers. Today, I'm not in New York City (I'm away from the nasty Northeastern weather) but I feel as much in touch as if I owned a huge flock of carrier pigeons or a large staff of messengers operating on routes dotted by inns with stables. I still rely heavily on face-to-face meetings – especially when it comes to meeting new people. Personal contact may actually be more likely to mislead than seeing what someone writes, but some part of us wants to see people talk. What is changing since 1999 is that many businesses have learned how to reduce the need for continuous face-to-face contact. Work at home, control from a remote location, and conference calling are all functioning more widely and reliably than they first did. The natural duopoly of newspapers and bankers, and their centralization in financial centers (my great-grandfather edited Holland's then-greatest newspaper in Amsterdam, founded on family links among bankers and newspapers), survived the introduction of the telegraph and the radio. It has also survived the creation of the Internet. We have seen recent stories about Silicon Valley's entrepreneurs seeking new locations because of high costs and inefficiencies, and the growth of new tech centers in the Midwest. This decentralization is a good thing for the United States, even if it creates challenges for New York City. Instant reporting and high-frequency and program-driven trading is vulnerable to cyber-malfunctions, accidents or cyberattacks. After 9/11, companies built huge physical back-office locations in readiness for a need to move. It made sense to decentralize. Geography is still relevant because cyberspace still depends on interruptible physical computers and power generation. You make some excellent points but if history teaches us anything it is that centers of power and commerce change for good or ill and many become irrelevant or disappear entirely. Nobody predicted the Detroit of 2008 in 1960 or 1970. The notion that Pittsburgh would not be a steel producer by the late 20th century was predicted by no one in the years after the war. There was no mention of the Internet in any business or general circulation publication in 1960. Buffalo and Newark have 1/2 the populations today that they had in 1960. Who predicted 30 years ago that Jacksonville, Fl, Utah, S. Dakota and other places would be centers of banking, finance, insurance and credit transactions? 1 New York, New York 7,781,984. 3 Los Angeles, California 2,479,015. 9 Washington, District of Columbia 783,956. 1 New York City, New York 8,175,133. 2 Los Angeles, California 3,792,621. 7 San Antonio, Texas 1,327,407. 8 San Diego, California 1,307,402. 10 San Jose, California 945,942. Cleveland, Baltimore, Detroit, St. Louis “disappeared". Jacksonville, Fl had a population of 201,000 in 1960 and 907,000 in 2017. Not even the town fathers saw that coming and as a result the city has been on a years-long road building project to handle the daily commuters. Predictions of future development of population movements and industries in the US have been historically wrong. No expert, urban planner, or politician foresaw the dominance of e commerce, the existence of Facebook, Apple, Amazon or the abundance of indigenous oil/natural gas during the gas crisis of the 1970s. The Dec. 3, 1973, cover of Time Magazine, "The Big Freeze", featured a lengthy scientific article about the earth's temperature decreasing and the coming of a new ice age. This expert prediction came before the catalytic converter was required for autos, which were spewing exhaust 5 times dirtier than current cars which burn cleaner fuels. Trucks were then burning dirty diesel, and there was extensive burning of coal to generate electricity. What odds do you think you would have received by making a bet in 1970 that in 2018, the fastest-growing states in America would be in order: Idaho, NV, Utah, Washington, FL, AZ, TX, CO, Oregon and S. Carolina (10th). Six of those states are clearly not in the sunbelt. So, I understand your well-made points but society and business moves so fast in the 21st century that the day when geography plays little to no role in most (not all) business is already upon us. One need only visit or do business with companies in places like Miami, San Diego any major TX city and a few dozen others to see how fast NYC is becoming old by comparison. If NYC's mass transit system continues to disintegrate and employ equipment nearly 100 years old, businesses and residents will accelerate the on going trend to depart. Daily 2-hour commutes have become unnecessary and unacceptable to workers, entrepreneurs and others who have options to avoid the cost and misery of driving, buses, trains and/or subways. The number of businesses, artisans and professionals who have left NYC and have benefited economically stands as daily proof that while in the real estate business location is everything, in the business and artistic worlds.... not so much anymore. March 1933. Later in 1933, all parties other than the Nazis were banned. March 5, 2018 — This date in 1933 (a Sunday then, a Monday this year) was the day after FDR took the reins as President of the United States. Nazi Party leader Adolf Hitler had been appointed Reich Chancellor by German President Paul von Hindenburg, the formal head of the German Government since 1925. An aristocrat (the "von" prefix signifies in Germany that someone has the title of, at least, Baron), von Hindenburg did not think much of upstart Adolf Hitler. 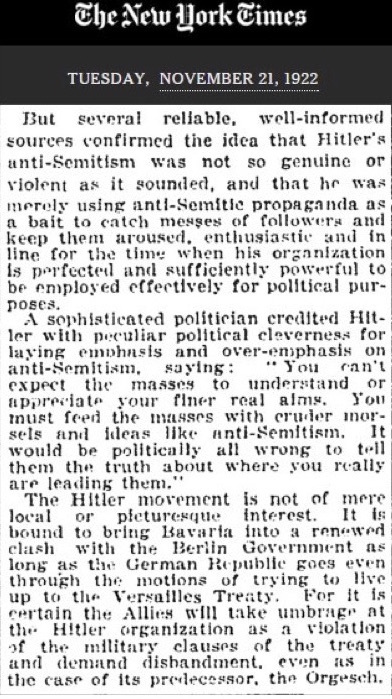 However, he was at his wit's end dealing with Hitler's appeal to a totally demoralized German people. Hindenburg hoped to establish control over the Nazis by bringing Hitler into his tent. He accused the Weimar coalition that ruled the country under the Social Democrats since Nov. 9, 1918, of generating 14 years of "Marxist" rule. He said that unless the German People reacted against this "Bolshevism", there would be anarchy. Finally, he said that Germany's fate was in the hands of Almighty God and the German voters. Hitler pays his (last) respects to democracy, 1933. 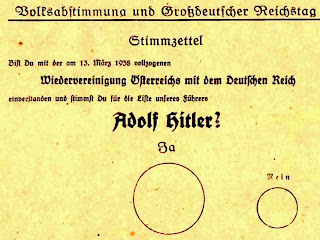 That 1933 election was the last that West Germans were given a choice to vote for until 1949, and it was the last free election in a united Germany until 1990. The March 1933 election made the Nazis not only the largest party, but a party large enough to prevail comfortably over any likely coalition. 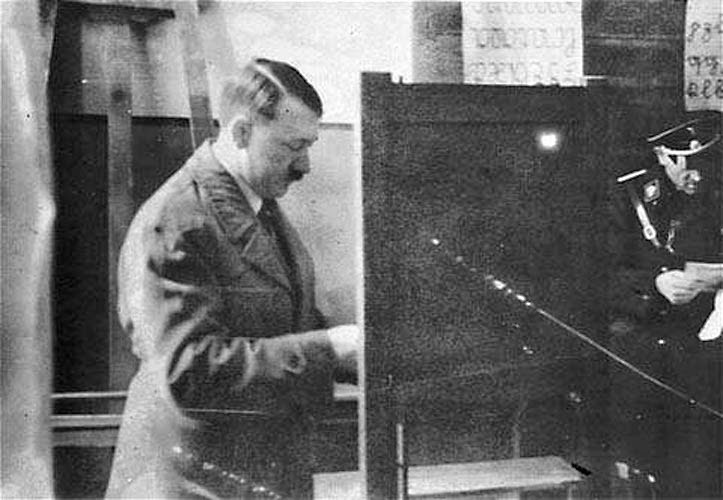 With a popular vote of just 33 percent of the German voters, because of the German voting mechanism the Nazi Party gained 44.5 percent of the votes in the Reichstag. This was a huge leap. 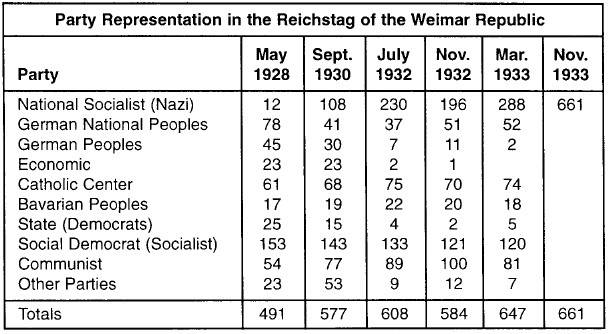 Hitler's Nazi Party had previously gotten nowhere, with less than 3 percent of the German electorate before the Crash of 1929 (see table above). Between 1928 and 1930, the Nazi Party grew from the ninth-largest party to the second-largest, with 18 percent of the vote in the Reichstag. Support of the Nazis in the Reichstag more than doubled between 1930 and March 1933, and became the largest party. The reason was a series of financial disasters that became global with the Wall Street Crash of October 1929. The disasters crushed the German economy. The Weimar Government seemed powerless to do anything about it. When the cost of rampant speculation in the 1920s is evaluated by history, the rise of Hitler, the Holocaust and the Second World War should be put on the negative side of the ledger sheet. To gain absolute power after the March 5 election, Hitler engineered the Enabling Act on March 23, 1933. This made Hitler dictator of Germany, subject only to the approval of President von Hindenburg. Approval of the Reichstag became unnecessary. Within months, Hitler banned all the opposition parties. 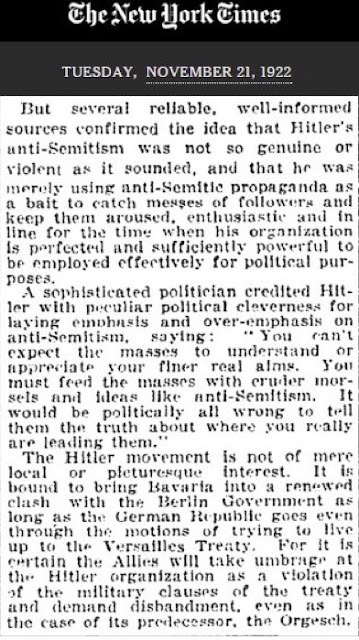 By November 1933, the Reichstag was nothing but an echo chamber for Hitler. That left only von Hindenburg in the way of Hitler's becoming emperor. In July 1934, von Hindenberg was 86 years old and dying of lung cancer. On August 1, Hitler's cabinet passed the "Law Concerning the Highest State Office of the Reich," which stipulated that upon the death of von Hindenburg, the offices of president and chancellor would be merged. Hitler would then be accountable to no one, becoming Führer und Reichskanzler des deutschen Volkes. dismissed as "not so genuine or violent". With this Cabinet decision in his pocket, Hitler flew to Neudeck, to the bedside of von Hindenburg. Conveniently, the President died the next day. Hitler was dictator. That was the end of democracy in Germany until the Bundestag was formed in West Germany after the war. Democracy for all of Germany did not return until reunification in 1990. In the United States, meanwhile, FDR took office and quickly turned around the financial panic with the round-the-clock help of his Republican Treasury Secretary, William H. Woodin, the railcar titan. U.S. financial markets were restored to stability, and the economic downturn was immediately reversed. But it was too late. The dim view in Europe of American democracy and capitalism since the Crash would take years to adjust. 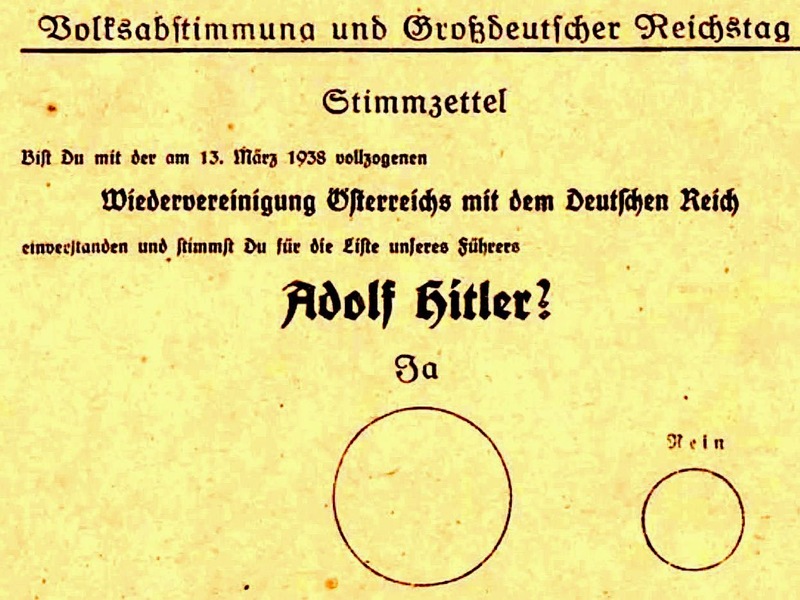 Desperate German voters were an easy mark for Nazi demagogues, who dealt with demonstrators with violence. In the wake of the Panic and Depression, a mad hater had taken control of Germany. FDR and other world leaders would have to confront this for the rest of his presidency. "a bait to catch masses of followers and keep them aroused, enthusiastic and in line[...]"
See the full story above. The New York Times story refers to the "Hitler organization" as a violation of the military clauses of the Versailles Treaty, and refers to "its predecessor" — the Orgesch. The Orgesch was named after a forgotten forerunner of Hitler, Georg Escherich (1870-1941). Escherish was a forester and politician with the Bavarian People's Party, which had 18 members elected to the Reichstag on the last ballot in March 1933 (see table at top). Since 1919 he headed the Bavarian Einwohnerwehren, the anti-communist home guard groups. In 1920 Escherich organized his supporters into the Orgesch (from "Organization Escherich"), an anti-Semitic paramilitary group, which violated the Versailles Treaty limit on the size of the German army to 100,000 troops referred to in the NY Times clip. The Orgesch established links with the Heimwehr in Austria, an early harbinger of the Anschluss. On the orders of the Allies in 1921, as part of wider moves against private armies that had sprouted up in Germany since the Armistice, the Orgesch was disarmed and disbanded. But as one devil was killed, seven new ones rose to take its place. The militias of the right, such as the Sturmabteilung and the Stahlhelm, Bund der Frontsoldaten, grew in size until they were disbanded in 1933 in favor of Adolf Hitler's personal bodyguard, the super-sadistic Schutzstaffel or S.S. The Nazi gangs were much harder to disband than those of the Orgesch. It's too bad that The New York Times writer did not foresee that. Two years ago, Timothy Egan in his Op-Ed, "The Beast Is Us," suggested why everyone who is concerned about keeping American democracy should remember March 5, 1933 — the day one-third of Germans voted and elected a dictator bent on a world war, enough voters to end contested elections while Germany took the world into war. Christopher R. Browning, Professor Emeritus at the University of North Carolina at Chapel Hill, reviewed a 998-page book by Volker Ullrich in the April 20. 2017 issue of The New York Review of Books (10, 12, 14). The book, Hitler: Ascent 1889-1939 (Knopf), shows how Hitler rose out of a weak democracy to become Germany's Führer. Check out this Time Line on Hitler's ascendancy to power to see how how Germany democracy eroded over many years. President Xi Jinping of China, September 2017. This is Part 2 of a two-part guest post by Heidi S. Fiske. The first post is here. Aggression by a foreign power, using a Latin American base, brought America to the verge of nuclear war in 1962. It began on October 14, 1962, when a US plane spotted a Soviet missile being assembled on the island of Cuba. President Kennedy convened a very small team to consider what to do. Invade? Bomb? He decided on an embargo, hoping to keep Russian warheads from reaching the island (fruitlessly, we later learned – the Russians already had 162 tactical and strategic nuclear warheads there). On October 22, a tense American public listened as Kennedy announced the blockade on television, and said that the United States was prepared to use military force to protect its security. After another fevered week of negotiations, the Soviets backed down and removed the missiles. But let’s consider what our position would be today if a hostile power had major bases in Mexico. Cuba is a small island 90 miles to our south. It was and is poor. We had robust international alliances all over the world. Our national debt was $298 billion, less than 10 percent of our GDP. While the Cold War was expensive, we were not engaged in any hot war. President Kennedy was schooled in history, hard-working and a very bright man with an outstanding cabinet. By contrast, Mexico is the 15th largest economy in the world. It is smack up against us for 2,000 miles, and has territorial waters that abut ours in the Gulf of Mexico and the Pacific. And we have a different sort of President now, presiding over a cabinet whose divisions and shortcomings are legendary. Our national debt is $20 trillion, 106 percent of GDP – before the new tax reductions and budget take effect. Thus if we found ourselves facing Chinese aggression via Mexico, we would be weaker than we were in 1962. And China would have far more territory, much closer to us, from which to launch a cyber or military attack. How likely is it that China might gain a military foothold in Mexico? The camel’s nose is its Belt and Road Initiative (BRI). China’s BRI may be the largest international investment project in history. Xi Jinping announced its two parts in the fall of 2013 – the land-based Silk Road Economic Belt (SREB), and the sea-based Maritime Silk Road (MSR). The BRI goal is to create infrastructure that connects developing countries. Less than five years old, it already covers more than 68 countries, equivalent to 65 percent of the world's population and 40 percent of global GDP. This may be a peculiarly Chinese way to seek influence. In On China, Henry Kissinger points to the stunning fact that, for 18 of the past 20 centuries, China had the highest GDP in the world. Its superb communications and roads linked markets among its vast population and territory. BRI is just such an initiative, this time on the world stage. Today, add China’s growing pre-eminence in AI and other key technologies to the mix, and its increasing use of authoritarian power to curtail what its citizens can see. “Technology in the service of an authoritarian regime is a very very dangerous thing,” says Robert Kaplan, author of the just-released The Return of Marco Polo’s World, which looks, among other things, at BRI. The scale of potential BRI projects is indicated by a proposed 19,000-kilometer trans-Pacific fiber-optic internet cable from China to Chile. To be sure, US-Mexican ties run deep and broad. There is a long history of friendship, cross-border businesses, and alliances. Many families on both sides of the border, at all socio-economic levels, are bi-national. And we share some important history and cultural roots, especially in the southwest. But this is spoken by a top official of the country that is building military bases in territory it does not own, in the South China Sea. How difficult would it be to convert major infrastructure installations in Mexico into bases for spying, cyber attacks or even a hot war against us? This is the real menace from Mexico. And it means that Trump’s attacks on Mexico are 180 degrees away from what strategic considerations would dictate. FINANCIAL REGULATION | "Community Bank" Bill, a Trojan Horse? The claim that community banks' profit margins are weak today is debatable. Community banks reported $6 billion in profits in Fall 2017, a 9.4 percent increase from the year before. Community bank loan balances were up by 7.7 percent over this same period. Loan activity was widely dispersed throughout the community banking population, with 75 percent of community banks increasing their loan balances last year. These strong growth figures hardly paint a picture of an industry that’s drowning in regulatory burden. Despite this, the community banking lobby has been actively lobbying Congress for regulatory relief for years. 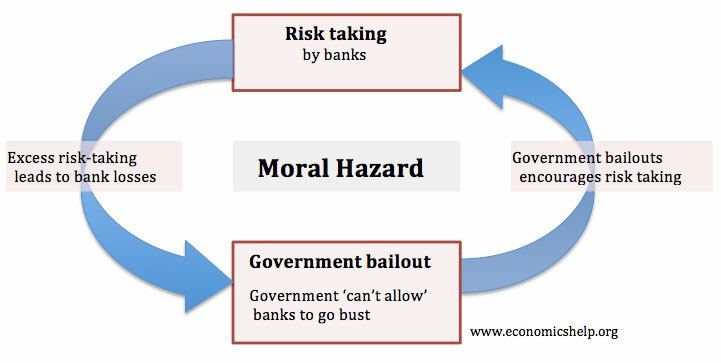 Republicans (and now some Democrats) have picked up this banner to argue that Dodd-Frank is crushing community banks. Flexibility in underwriting when issuing mortgages, allowing community banks to benefit from Qualified Mortgage safe harbor. Complete exemption from enhanced prudential standards including stringent capital rules, the LCR, and stress testing. Less expensive FDIC insurance coverage compared with larger banks. Through the ICBA, community banks have long insisted that the cost of complying with regulations is too high. 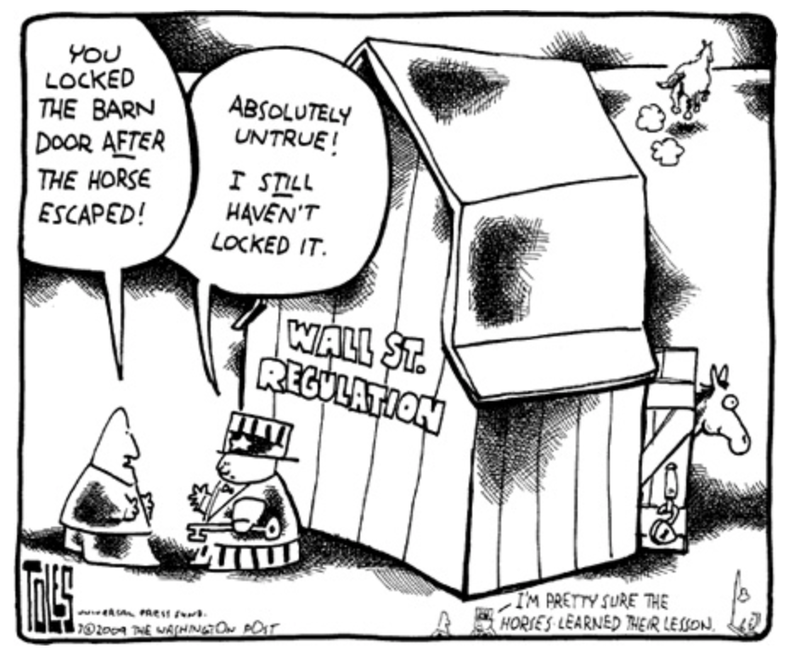 This is no more true in the post-Dodd-Frank era as it was prior to its passage. Dodd-Frank is not the problem. Local banks are an important part of the small business ecosystem and community banks are four times more likely to operate in rural communities. They are a vital part of the national economy. According to a GAO report published in February, community banks are mostly concerned about Home Mortgage Disclosure Act (HMDA), Bank Secrecy Act, and TILA-RESPA disclosure regulations. While S. 2155 does attempt to address some of these concerns (in the case of HMDA requirements, quite controversially), the majority of the bill offers, at best, a bad magic trick for community banks. For instance, banks below $10 billion are exempt from the Volcker Rule which prohibits banking entities from proprietary trading or entering into relationships with equity funds. This is largely an empty gesture – few community banks engage in any of the activities outlawed by the Volcker Rule. Any marginal gains for community banks will be offset by Title IV’s dismantling of requirements on medium-sized banks, which, paradoxically, could trigger further consolidation in the financial sector. The resulting spike in merger sand acquisitions will reduce in-market competition. Many Republicans have lamented the original $50 billion SIFI threshold as being arbitrary and, by extension, inappropriate. Even granting the premise does not justify this new legislation. If the number is arbitrary then so is the $250 billion level they are raising it to. However, the change will have clear repercussions as institutions begin swelling their portfolios to raise to the new cap(s). Institutions that have previously floated just below the $50 billion threshold will start to consume community banks without any disincentive. In a poll conducted by Americans for Financial Reform, 67 percent of people oppose the loosening of banking regulations in S. 2155. Voters have realized that this bill deregulates much bigger banks than the “mom and pop” institutions proponents of the bill like to emphasize. It is evident to 67 percent of voters polled that this bill is not only going to deregulate the same institutions that sent America into a financial crisis, it could also increase the deficit and hurt Americans for years to come. CBO estimates that enacting the bill would increase federal deficits by $671 million over the 2018-27 period. That deficit increase comes from an increase in direct spending of $233 million and a decrease in revenues of $439 million. Some of that cost and reduction in revenues would be recovered through collections from financial institutions in years after 2027. CBO also estimates that, assuming appropriation of the necessary amounts, implementing the bill would cost $77 million over the 2018-27 period. Like the tax bill, this act will kick the bill to the grandkids of today’s new voters. All in all, 17 Democrats voted in support of the cloture motion. Senate Majority Leader Mitch McConnell will now have to decide whether he will allow an open amendment process to take place. Few expect an open process as it may force some difficult votes onto moderate Democrats. While this is happening, lobbyists are outspending progressives hundreds of dollars to one every day in defense of this bill. Minority Leader Schumer and the Democratic caucus may be better off with a full tree and a closed amendment process. The next big ticket item to look out for would be the manager’s amendment sponsored by the architect of this bill, Sen. Crapo (R-ID). The following guest post was written for CityEconomist by Heidi S. Fiske. There is a looming menace from Mexico, but it is none of the ones identified by Trump. The threat is not one of drug dealers, rapists, and murderers flooding across our borders. It is not MS 13. It is not jobs lost to Mexican workers or Mexican factories or Mexican steel. They are flyspecks compared with the real danger that Trump is creating by his relentless insults, as well as his threats to NAFTA, his proposed tariffs, his cancelling of DACA, and his insistence that Mexico pay for a border wall. And to add insult to injury, he has just announced his plan to send Jared Kushner (who just lost his White House security clearance) to Mexico tomorrow to meet with President Enrique Peña Nieto. The real menace is the strategic threat to our security that an emboldened China may pose, using an alienated Mexico as its base. 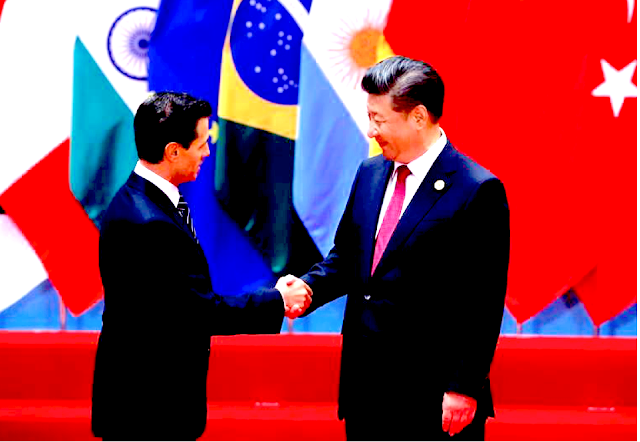 China has recently, sweepingly, broadened its Latin American ties. And just as it has gotten stronger on the world stage and filled some of the vacuum created by Trump’s unilateralism, it has not, as the US hoped, gotten more democratic. On the contrary, it has tightened authoritarian control, flexing new muscle against foreign enterprises on its soil, and forcing western news outlets to limit what Chinese citizens can see. Most strikingly, on February 25, China's Premier Xi Jinping arrogated the power to rule for life by abolishing the two-term limit that had been the law. The National People’s Congress is expected to rubber stamp his decision this week. Does China as a major force in Mexico sound unlikely? To be sure, it will not happen fast. But a look at the history of aggression from the south, and of China’s recent moves, shows that it is a geopolitical threat of such potential magnitude that we should be vigorously working to counter it now. But Trump is doing the opposite, and thereby encouraging Mexico to turn away from the United States, however reluctantly. His insistence that Mexico pay for the wall, for instance, has caused Peña Nieto to cancel two trips to the United States, most recently last month. And on March 1, career diplomat Roberta Jacobson, our highly respected ambassador to Mexico, announced she would quit in May. As Trump has not even proposed a candidate for Assistant Secretary of State for Western Hemisphere Affairs, her departure leaves us particularly depleted in Latin American diplomacy on the highest levels. Reportedly much of retiring Ambassador Jacobson’s time has had to be spent smoothing ruffled feathers rather than accomplishing substantive gains in Mexico. What has happened since is, if anything, worse. Last week I checked in with Warren Hardy, an American who became a Mexican citizen in 1990. Beginners at his Spanish language school in San Miguel de Allende are treated to an hour-long history lesson designed to impress on them that Mexicans are inordinately sensitive to being insulted. Mexicans, he explains, have great pride in their indigenous cultures on the one hand, but have been brutally treated successively by the Aztecs, Spanish and most recently the US on the other. The result is that “the core value of the Mexican people is respect. Mexicans demand respect from each other and particularly from foreigners. What Mr. Trump has done is strike a blow at the heart of our relationship by calling Mexicans rapists and criminals." Small wonder that Mexico’s leaders are looking for new partners. When Trump renewed his threat to scrap NAFTA late last August, slamming Mexico in the process, the very next week Mexican President Enrique Peña Nieto travelled to China to discuss increased trade. While there, he participated with 800 business leaders in a summit of the BRICS nations (Brazil, Russia, India, China and South Africa), which Mexico might join to cooperate on investment, trade, finance, and the sea. And the day after that Peña Nieto visited the Alibaba Group, hoping to get more Mexican products onto this China-based leading e-commerce platform. Could increased trade with China morph into Mexicans being receptive to becoming a base for aggression against the United States? Consider events a century ago. In January 1917, Germany’s Foreign Office proposed to the Mexican government that, if the US entered World War I against Germany, the Mexicans should fight on the German side, thus making it a two-front war for the US. In return, Germany would recover Arizona, Texas, and New Mexico for Mexico. The famous Zimmermann Telegram that conveyed this offer was intercepted and decoded by British intelligence, which shared it with America in March of 1917. It backfired mightily on the Germans. So enraged was the American public that President Wilson went before Congress and swiftly won a declaration of war against Germany on April 6, 1917. As it happened, Mexico turned Germany down, not believing that it could deliver either financially or militarily on its promise, or that Mexico could control the large English-speaking territories it might have re-acquired. But there was fertile ground among Mexicans to accept an offer that promised revenge on the United States, just as there is today. It was not just because the United States had seized almost half of Mexico in the Nineteenth Century. The United States had invaded Mexico in 1914 to protect US business interests during the Mexican revolution, and again in 1916-17 in a vain attempt to punish Pancho Villa for killing Americans in New Mexico. While this German effort fizzled, 45 years later, a military threat from the south, from Cuba, became very real indeed. In my next post, following shortly, we examine that threat, how much worse it would be if it were repeated today, and just how China is moving into Latin America. Here are some negative reviews of S.2155, collected by Sen. Sherrod Brown (D-OH). The following is Update 253 from Dana Chasin, on S. 2155 and Systemic Risk. Washington, DC, March 5, 2018 – With S. 2155, the "Economic Growth, Regulatory Relief, and Consumer Protection Act," set to hit the floor tomorrow, attention is now turning to the least discussed and most abstract — and systemically most consequential — part of the bill. Title IV of S. 2155 is not like the first three titles, which involve benefits provided to a diverse range of stakeholders, with tradeoffs for competing stakeholders. Title IV's Section 401 provisions benefit just 30 out of the nation’s top 40 financial institutions, exclusively and generously. One of those provisions was the ABA’s chief legislative goal for 2017. Section 401 of the Act has a negative impact on the safety and soundness rules as they apply to the biggest financial firms in the country. Section 401 of S. 2155 provides for a five-fold increase in the size threshold for firms to be subject to enhanced prudential standards. These standards themselves are then weakened further in the rest of the Section. The ABA-prize centerpiece of the legislation increases the asset threshold for the automatic application of post-crisis safeguards, known as enhanced prudential standards, from $50 billion to $250 billion. This change would deregulate 25 of the country’s largest 34 banking institutions. These 25 together hold $3.5 trillion in assets and collected a total of $47 billion in TARP funds after the financial crisis. Raising the asset threshold from $50 billion to $250 billion would amount to the largest rollback of Dodd-Frank to date. Section 401 gives the Fed discretion to re-apply enhanced prudential standards to financial institutions with total assets between $100 billion and $250 billion, should they pose substantial systemic risk. Given the option, however, Trump appointees responsible for reapplying standards are likely to err on the side of under-regulation. Fed Governor Randal Quarles, a known opponent of the enhanced prudential regulatory regime under Dodd-Frank, is unlikely to retain many of these standards for institutions with assets under $250 billion. Worse, it is possible that under the proposed law the Fed will lose discretionary powers to administer enhanced prudential standards even to the largest firms. S. 2155 would amend Section 165 of Dodd-Frank by changing the word "may" (with regard to the Fed's ability to tailor the application of enhanced prudential standards, based on "risk-related factors") to "shall." The wording change puts greater pressure on the Fed to weaken its enhanced prudential requirements even for the very largest SIFIs, and would encourage financial institutions to file lawsuits if the Fed decides to put them on the list. Post-stress capital levels have increased substantially since the crisis, demonstrating the positive overall impact of mandatory stress testing on the health of the financial system. Last year, 33 of the nation’s largest 34 banks passed CCAR stress tests — an indicator that these institutions are better able to withstand crisis conditions. $50 billion to $100 billion in assets: Banking institutions in this asset class would no longer be subject to Fed-run stress testing. $100 billion to $250 billion in assets: 18 months after the enactment of this legislation, banking institutions in this asset class would no longer be subject to annual Fed-run stress tests. A substitute test would simulate performance only under an adverse economic scenario, meaning these banks would no longer undergo stress testing that measures baseline and extremely adverse economic scenarios, and would likely be tested less frequently. As with other enhanced prudential standards, S. 2155 grants the Fed additional authority to exempt banks in this asset class from stress testings before the 18 month review period. Banks with $250 billion or more in assets: 18 months after the enactment of this legislation, banking institutions with at least $250 billion in asset size will no longer be subject to Fed-run stress testing that measures adverse economic conditions. These banks will only undergo stress testing that measures performance under baseline and extremely adverse economic conditions. The Liquidity Coverage Ratio (LCR) directs financial institutions to hold a certain amount of High Quality Liquid Assets (HQLA), relative to their net outflows. This ensures that SIFIs are able to cover losses in the event of a market shock without defaulting or contributing to a crash. As with all “enhanced prudential standards,” this bill would allow the Fed to relieve banks with less than $250 billion in total assets from the constraints of the LCR — a uniquely excessive deregulatory measure. The Fed has already “tailored” the LCR for banks between $50 and $250 billion in asset size by adopting what is known as the modified LCR (mLCR). This means that the Fed has already decided that these institutions should have different regulations and apply them appropriately. The Fed is also currently considering changing the mLCR for these institutions on a sliding scale with new ratios. Codifying that they “shall” consider each institution individually and quintupling the asset threshold will either be irrelevant or, given the current and incoming crop of regulators, extremely dangerous. Banks with total assets between $50 and $100 billion would be immediately exempt from the requirement to submit annual living wills. Banks between $100 and $250 billion would be subject to the Fed’s discretionary oversight, pending an 18-month review period. The extent to which the Fed would require these firms to continue resolution plan submissions is unclear. Chairman Powell has been broadly supportive of living wills and the other pillars of Dodd-Frank, but others at the Fed, including the new Vice Chair for Supervision Randal Quarles, have been less supportive in the past. In his remarks before the Senate Banking Committee on Thursday, Chairman Powell remarked that the financial system is much healthier now than it was in 2007-08, and specifically cited living wills as having contributed to this stability. The banking industry is generally supportive of the provision. In December, JPMorgan Chase Chairman and CEO Jamie Dimon expressed his belief that living wills were “good for industry.” It is widely acknowledged that the very process of preparing these submissions, under an explicit mandate of the law, actually helps banking institutions’ management to gain a better enterprise-wide view of their businesses. There is also begrudging Republican acceptance for living wills. Resolution planning prepares firms for potential liquidation, and makes it less likely that they will have to go through the FDIC’s Orderly Liquidation Authority (OLA). Many Republicans claim this special resolution alternative distorts the market by circumventing the bankruptcy process, and this mistrust of OLA tempers their distaste for living wills. Despite this broad acceptance of the importance of resolution planning, S. 2155 would mean that many the nation’s largest banks would no longer be required to submit these plans. Just a decade after the largest financial crisis in nearly a century, S. 2155 seeks to deregulate some of the most systemically important banking institutions in the country. The bill’s creators set out to bring regulatory relief to community banks which they claim are overburdened by onerous compliance costs. While the bill does bring some modest relief to these small banks, the most impactful section of the bill is focused on reducing burdens on much larger banks that have registered record profits in recent years. A cloture vote on S. 2155 is scheduled in the Senate tomorrow. That procedural measure is expected to pass easily. And then comes the floor debate and possibly amendments, but possibly with an agreement among the bill’s supporters to lock arms as was done in a Senate Banking markup that saw no amendments adopted. The floor speeches may be more interesting. *DB USA Corporation and Santander USA Inc are Intermediate Holding Companies of foreign-based banking institutions. and "Wall Street on Parade": http://bit.ly/2DeKeJq.